It has been nearly 10 years since founding an initiative in the company I formerly worked in called “JetWiki”. JetWiki was a cutting edge idea in it’s time and was a fair decade ahead of it’s time. The online encyclopedia, Wikipedia.org, was maturing, even though the occasional radio show host would still refer to it as “the site where you can create a page about yourself”. But the real innovation of Wikipedia.org was the engine that the website ran on: MediaWiki. MediaWiki used PHP to server-side generate dynamic web pages based on user query and database lookups, but extended further to allow the user to interactively edit the very page they were viewing. Any user could have editorial responsibility over the content to create an organic and varying information source for a larger audience. I wanted to try an experiment with a small team. I found an old machine that was being discarded (a Compaq Evo D31VM) and installed Debian Etch. I also installed Apache, PHP and MySQL to provide what we today called the ‘LAMP stack’. I installed MediaWiki above that and it simply worked. Three users were initially created, but at first I was the only one who used it for the first month. There was a very good reason for that: I didn’t exactly know the optimal method for using this tool. I wanted to access and store information where the path to the data was intuitive and required a minimum of mouse clicks. This wiki was tasked with tracking maintenance items in a 70,000 square foot manufacturing facility that consisted of two lines and two batch-work stations and three additional departments. I was unsure if I should sort the items by geographic location or by function, much less, how each paradigm can be optimally implemented. My solution was that I did “All of the above”. I used both paradigms and decided to see which one I favored after a few weeks of usage. The geographic paradigm ended up staying, but only in the context of the building as a structure. 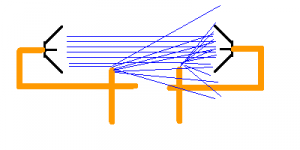 The ‘function’ paradigm was a hierarchy of subsystems where encompassing descriptors for page names were given, such as: “Line 1” or “Light Assembly”. Beneath these descriptors, were entries that could be followed by clicks where “Line 1” follows with “Washer Stage 2” follows with “Exhaust Blower” which loads a page that describes the maintenance history and Minimum Tool List for servicing this subassembly. A few clicks leads the operator to form a ‘go-kit’ to service the equipment in a single trip across the plant floor. The beauty of a wiki is also it’s challenge. It is a clean slate that you can define. In creating this wiki, you must be prepared to admit that your present method may need to be changed. The users of the wiki must be permitted to make decisions over how they use it, but it is just to create a template as a starting example. As I am writing this, I am also writing a book on the topic. This will be available with my training seminars or from Amazon. When it is complete, the information will appear in this paragraph. It’s been awhile since I’ve written anything on my platform here. As I manage my own information system, I should be using it more than I do those that belong to other people. I attended and volunteered for the AISES (American Indian Science and Engineering Society) in Minneapolis. The purpose of this article is to explain why I am a part of this. AISES was founded in 1977 as a collaboration of engineers who needed to create a society to foster inclusion of Native American, Canadian First Nation and Alaskan Natives in the engineering fields. Over the decade that followed, the discipline widened to include natural resources, health care, education and tribal college approaches towards preparatory education. Into the millennium, STEM and STEAM paradigms that collectively represented science, technology, engineering, arts, and math were gathered into a holistic educational approach in a cradle-to-grave continuous improvement through K-12 studies up through post-retirement mentorship. AISES was quick to institutionalize this model into their own strategy. With initiatives such as Full Circle and the more informal concept of the ‘AISES family’ which was in part inspired by the success of community workplaces that were innovated in the late 1990s. Annually, since 1978, the national conference is the Woodstock, if I may use such a comparison, of all Native American engineers, engineering students and youth whom are inclined towards the sciences. One attribute that I am certain that has contributed to AISES success is the parochial approach to a pan-Indian religious and cultural belief system. The formation of the Council of Elders by Phil Lane, Sr. created a three-way check-and-balance between the Board of Directors and the CEO of the organization to ensure that the membership is not alienated by a cold and impersonal system. In the historical past in most educational systems, most students were expected to metaphorically check their culture in at the door and transform into a foreign being for the purpose of education. AISES was an early advocate for the commingling of culture and science to attain a greater student benefit and more productive human being. I personally invite you to join me as I present at the AISES conference in Denver between September 21st to the 23rd. Don’t take my word for it, I hope to see you there and find out for yourself. I have returned to the U.S. after an extended visit to Germany and Spain. I didn’t have much time to author much during this interval, but I’m still keen to work on a free e-book/website for good form in coding in C that is targeted towards the self-taught novice whom has gotten a start in BASIC and it’s derivatives. During my visit, a friend at a multi-national engineering firm secured me tickets to visit Automatica in Munich, Germany. The goal of the visit was to shop for robots to aid in production systems and I had the privilege of tagging along. I posted a video to youtube of one of the more impressive robots that I saw (swinging around a BMW hatchback with effortless ease) and is available at the link below. After the sanding, painting above the water line. Since returning, I have been working on developing my business venture and helping my father with deferred maintenance. Painting the wood on the house is next. The wood exterior is getting quite old, but is well preserved. After all, there must be five or more coats of paint on the wood. 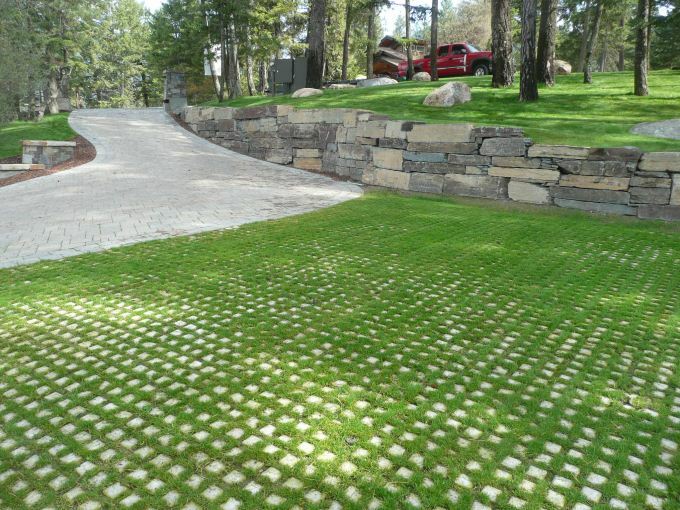 Give Your Facility a Drivable Greenspace with Permeable Pavers. Parking lots are hot. They absorb sunlight (and self destruct due to the resulting heat and ultraviolet radiation) and contribute to the urban heat island effect. With extreme temperature cycling on a daily basis, while impregnated with rainwater and ice, they are an expensive maintenance item. Several years back, I visited Europe (Bayern to be exact) and saw a brilliant idea for making parking spaces into green spaces. The use of permeable concrete pavers. These pavers are typically made of concrete and are approximately 50% open to allow for organic life to grow through and provide a cool and relaxing green covering to an otherwise brutalist urban landscape. In this approach, grass absorbs the solar energy through photosynthesis instead of reflecting onto your building or transforming into heat energy. This makes your drive and parking spaces visually appealing, climate comfortable and creates a public image of environmentalism. When it does come to mowing the parking lot, it’s not so bad. The traffic grinding the blades of grass into the pavers will have a trimming effect that keeps much of the surface under control. These can simply be laid on top of your existing surface and be covered in surface soil to fill the gaps. Toss grass seed or insert plugs of sod, you are on your way to being having a parking lot that will be the front page story featuring your building. I do admit I like my sugar. There are compelling arguments for it’s negative effects on human health as demonstrated by Robert Lustig in the early 1970s in his book, Pure, White and Deadly. On the counter, I have also embraced the arguments of Roy Baumeister of Florida State University’s Psychology department. Through years of experimentation, he observed a correlation between available blood glucose and human performance as he seeks to quantify the mental trait of willpower. While countless self-help authors have focused on spiritual approaches, his are scientific approaches backed by carefully administered experiments. For willpower, in my opinion, he wrote the authoritative text on on the subject with his book Willpower: Rediscovering the Greatest Human Strength. Like most armchair psychology books, 90% of the info was stuff that my grandmother taught me. The other 10% paid it self over many times and has led this book to be gifted to numerous friends and colleagues. His hypotheses was based on over half the blood glucose, being consumed by the brain, would have an effect on a person’s ability to not only control impulses of habit or indulgence, but also provide mental endurance to continue with arduous or mentally challenging tasks. His experimentation techniques varied across different scenarios and national datasets, but the most compelling was students performing never-ending adaptive computerized math testing with two groups that differ in the presence of sweets. The group with the sweets did perform longer and stronger than the control group. Diabetics however, were found to not fare so well and national crime data supports this suspicion. Diabetics are more likely to be convicted for crimes of impulse on a national scale, likely due to uncontrolled metabolism of blood glucose. The outcome of this book brought about a change in my workplace. 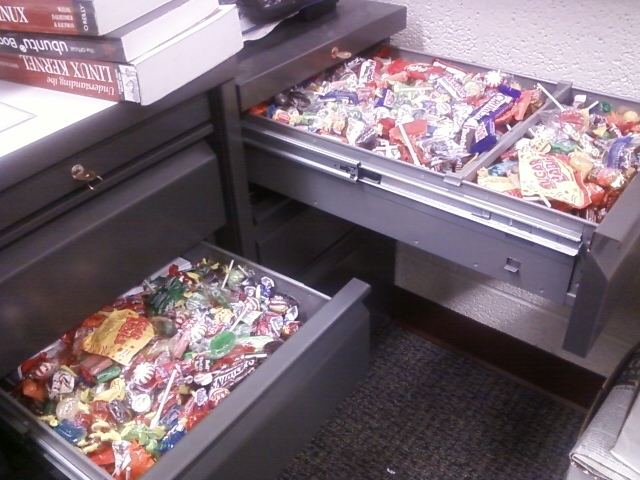 Seeking to improve performance, I stocked my office and a multi-purpose meeting and classroom with wicker baskets piled high of candies of various sorts. In my method, I steered clear of chocolate due to the hedonistic eating leaving me with an empty basket in the course of two hours. Hard sugar candy had a much more regulated consumption. Yes, they loved it and I achieved a saintly status for implementing this. Rooted in science I knew that it made a benefit even though it was practically impossible to measure with such a small population size. In workspaces I frequent, thinking smarter is better. Just be sure to lay off the chocolate. The alarm is only triggered by a flowmeter due to a sprinkler valve breaking. Most employees had left for the day, greatly reducing the likelihood of an accidental breakage. We had our accidental breakages and dealt with them with a sense of humor. You could always tell whom was directly involved by pointing out the soaked employee in the lineup. But the smell of burning plastic outside my door alerted to me that this was no drill. The plant was at zero capacity for one day, and at one-half capacity for 6 days (two weekend days included). The minimal downtime considering a burned out production line is a great success story towards disaster preparedness. Tornados, earthquakes or fires can happen at any time. Two of the three I have experienced in a production environment that resulted in emergency actions and repairs to be taken. To hell with production, shut down the affected building. And shut down the entire building before vehicles with red lights show up. In our case, we had a ‘go kit’ prepared to shut down subsystems in the event of an emergency. Consisting of a screwdriver, wrench and lockout gear, usually this is intended to shut off equipment that has failed destructively. In this case, it locked out the building. Most equipment with burners will interlock off with a loss of gas pressure. This removes an energy source that can feed a fire or fuel an explosion. Make certain that your go-kit includes an adjustable wrench capable of operating this value. Know the shortest route to this valve which is almost certainly located on the outside of the building. If you gas-train has multiple valves, your energy supplier will gladly support you in identifying the most effective valve. If you have equipment that runs on external fuel storage, such as diesel fuel or propane, those also must be disabled by closing the fuel line, or if that is unavailable, locking out the equipment. This kind of equipment is typically air compressors or backup generators. Lock out every valve you shut with a real lock. Mind the backup generators. Disable those first. Backup generators don’t apply to these situations; they are designed to replace external utility failures. Know what you need to do to pull the switchgear. Maybe even practice once during a time the facility is not operating. Switchgears have a limited life and can only be pulled 10-15 times before needing service, so use this operation wisely. They can be difficult to pull as you are powering a spring-loaded clockwork that powers a mechanical current interrupter apparatus once the lever is pulled to a sufficient distance. Do not bother with the smaller switches first as you are increasing the likelihood of breaking the equipment for no appreciable increase in safety or minimization of liability. It is cheaper to rebuild one switch, instead of two or three. Lock out every primary switch with a real lock. This is not such a big deal, but a luxury item. In the unlikely event of a collapse fracturing a pipe, the air could rapidly oxidize the flame, increasing the efficiency of the combustion. Vented air is very loud and dangerous, be physically prepared for this. Projectiles of dust and oil will leave the line as well as lift dust in the area, creating in inhalation hazard. Protect your ears and quickly vacate the area. There is a lot of water, and if your environment includes hazardous chemicals, the fire department water can be interpreted as hazardous waste. Make a good effort that loading dock drains, sump pumps are not able to release to the city sewer or storm drains. Sweep the resulting water into the areas. In our case, a loading dock as an improvised storage pond. A rush order of 55 gallon drums had the fluids contained. Notice I said above to use a real lock. They are difficult to defeat and are considered a viable lockout mechanism in most scenarios. It has a secondary benefit. It often occupies a single lockout point that prevents the utility companies from attaching their own lockouts. Most of the time, the emergency responders are satisfied seeing a lock, regardless of origin, attached to sources of hazard. When a city agency or utility places a lockout, you can be forced to undergo a lengthy assessment of the entire building (why you lock out the entire building instead of the affected region). City inspectors are busy people and there is often a scheduled time a few days in the future for them to inspect repairs. If you are non-compliant in your repairs, the entire building can remain disabled during the time the next meeting is scheduled. You can negotiate with the inspector to justify turning on regions of the building that you can prove to be isolated from the utilities by additional lockouts, as was the case with our fire. We had secondary switches that enabled certain regions and equipment in this building. We locked out the ones in the affected regions and when the inspector was assured of our configuration, we were cleared for operation. This all occurred on the morning of the morning after. Know all the paths from your go-kit to each of your energy sources. Shut off natural gas, then liquid fuel, then electricity, then compressed air. Do not let your path traverse across production lines so that you don’t run into equipment or become snagged by a hook handing from an overhead line. Test that the tools work at each of their destinations. Lockout at every point. Make certain that you know how many locks you need. Identify the low points where contaminated water will collect. If there is storage that cannot become wet, determine risks of this flooding. When I was an undergraduate at Iowa State in the mid-2000’s, I became fascinated with the research that was conducted under the programs or Vikram Dalal and Gary Tuttle. My self adopted mentor, Dr. Curtis Sell whom I originally knew through the amateur radio club on campus and also recruited for my tutoring-for-pizza venture, was a very active participant in the microelectronics program. The joke in that department was that “You get your masters for repairing the equipment and your PhD for using the equipment you repaired” The equipment consisted of a PDP-11s and other mid-1970’s era equipment that had been likely discarded from prominent semiconductor fab firms that regularly contribute to the college. Despite the old equipment, much of the work I had witnessed was groundbreaking glimpses into the future. Photonic bandgap research that gave birth to on-the-die RF channels (waveguides) happened in this lab. I was fortunate to have surrounded myself with some of the more brilliant graduate students doing dazzling work. I also got to see the other side. Those high on the ‘what-on-earth-is-he-trying-to-do’ quotient. Usually confident, and somewhat self-assured, yet hiding in an office space, strategically arranged so that their desk, monitor or work area is entirely obscured from the vantage point of the doorway window. It is from one of these people whose experiment I witnessed stuck with me to this day. Imagine the world of radio. 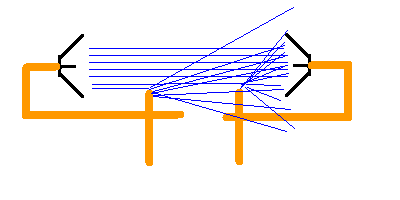 Terrestrial radio signals almost universally appear deliberately from, or as a consequence of an electronic circuit. These circuits, and the antennae that radiate signals are almost exclusively made from metals. Metals allow for a very easy electron flow, so they are ideal conductors, but they also can cast very elaborate shadows (imagining radio waves as visible light) and diffraction patterns. Modern human beings are well aware of this as we have adapted by learning the ‘cell phone dances’ which include steps such as the spin-around, the stretch-neck-tilt and the circling-wanderer. What you are doing is finding the sweet-spots that exist as columns and rays criss-crossing the area due to diffraction pattern due to building, steel rebar or radio interference. With this kind of knowledge expected of an ISU Electrical and Computer Engineering Department undergraduate, I was dumbfounded to see an antenna experiment set up incredibly awkward. Not a useful RF experiment. If you are doing an experiment, do not be too confident to ask your peers if they see any flaws that may wreck your experiment. The Journal of Irreproducible Results exists as a joke, and no, they seldom make calls for papers. Use skilled and trusted people around you to make your work great, but if even a total goofball makes a suggestion about something being invalid or incorrect, take the criticism with a grateful appreciation and give the comment or idea a thorough analysis. This semester, I am studying under Dr. Yadav of North Dakota State University in his course of Experimental Design. The assumptions at this level are that your apparatus is reasonable, but approaches a scientific method in which experiments are conducted. It is possible to destroy the validity of a perfectly good experiment by using even the wrong techniques during measurement, and your apparatus may be of a highly-elegant configuration. Randomized ordering of experimental controls and statistical analysis of your data with multiple runs will give you a bank of data where noise can be filtered using statistical models. It is not good enough the step through your controls in a linear manner, taking repeated data points on each pass, but instead randomize the experiments such that each pass requires changing at least one control. Do not repeat your data points multiple times with the same control values, instead replicate your data points by performing each experiment as if it were the first pass. Save the data aggregation for the statistical analysis use the data is collected. I saw an interesting exam problem in my graduate level statistics exam. What was particularly interesting was that we were given a problem that could not be solved with a calculator, or by obvious simplification methods. For this, I am self publishing this document that describes an algorithmic approach to solving hypergeometric distributions that would be otherwise insoluble using conventional methods. My software authored for this is accurate and is differentiated from Wolfram Mathematica or Alpha in that the method and code is open to academic scrutiny. This is a lesson in vaporware. Vaporware is a software or hardware solution that enters a high demand market without any actual viable solution. Often times, they pretend to be professional, but through social media, they are actually heavily locked down information machines. Photoshopped images of the application running on a PC. Be sure to notice the presence of a beautiful generic woman on a beach in the application window. Facebook pages that are locked down to where negative feedback is tightly controlled. Be sure to notice that they are the only ones that post of their page. Mailing lists or support forums don’t exist. Be sure to notice that buttons that subscribe you to a mailing list opens a webpage on a separate website that never finishes loading (times out). If the software downloads, it will have enormous amounts of configuration choices that aren’t targeted towards the actual purpose of the software. Be sure to notice video conferencing software that doesn’t have a “Add webcam” feature, but allows you to configure various nuances to how the application appears. The software is ad sponsored and has no uninstall capability. In this package, I haven’t noticed any ads just yet, but I’m waiting. First though, I have to run it again and currently, I have no reason to. I’m not sure why peer-to-peer video conferencing is such a magnet for these kinds of fluff projects. It really shouldn’t be so hard to do. The webcam and microphone are data streams. You encode them into a streaming format (MPEG, WEBM, OGG, H.264 if you insist) and pipe them out to an IP address. A little extra effort, you can even use a SIP protocol, but it isn’t necessary. How can a project like this be saved? It takes honesty. Create open and world viewable forums. Yes, people will post bad things about your software, but make a show of working towards a solution. Open up your social network sites and use them to recruit developers and users instead of information control marketing machines. Don’t go the way of the Ekiga softphone of the late 2000’s. They were the official softphone of Ubuntu linux that was included with their distribution. Problem is that it never worked. There was no improvement. And by 2010, they were expelled from the distribution. They’re still around, but I don’t dare install their product. I simply don’t trust them with my limited hard disk space. I look forward to a day that an free and open video conferencing software becomes a reality. Then, we can truly divorce ourselves from the spooky usage licenses (and potential eavesdropping) from services such as Microsoft Skype, Google Hangouts, or Apple FaceTime. 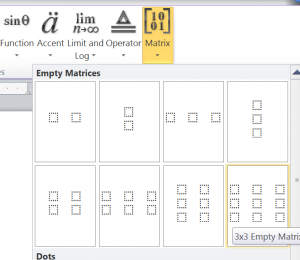 Ever want to simply go beyond 3×3 matrices in the Microsoft Word 2010 Equation Editor? 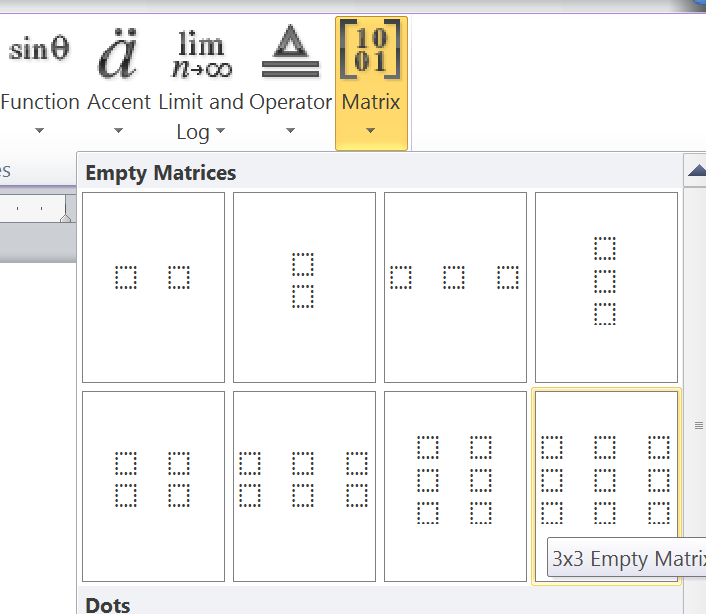 You don’t have a lot of choices for dimensions of matrices. It looks like 3×3 is as large as you can go, but you can go ‘under the hood’ to create matrices of arbitrary size by switching between “Linear” and “Professional” modes. Let’s first create a 3×3 matrix and populate it. It doesn’t have to be 3×3, but for sake of explanation, it makes a clearer example. Once you have the matrix complete. Click on the black arrow on the lower right-hand corner of the Equation Editor. This pull-down window selects between Professional and Linear modes. 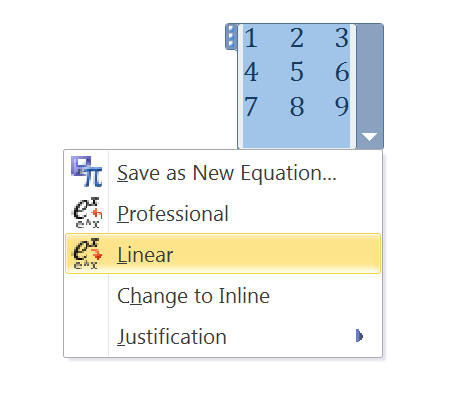 Click on Linear. 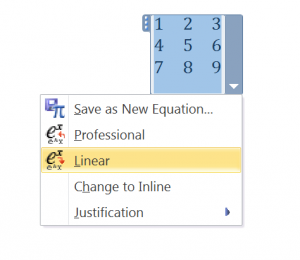 You will see your equation editor change the layout of the equations into a textual form. You can think of this as a markup language for the matrix editor. Textual mode of the equation editor. The ampersand symbols delimit the columns and the at symbols delimit the rows. 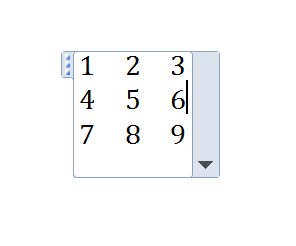 If you have an incomplete entry of a row or column, the equation editor will try to make it complete. A larger matrix created and fully populated to resembler a DTMF key arrangement. At this point, go back to your menu and switch back to professional to view your new matrix. And there you have it. 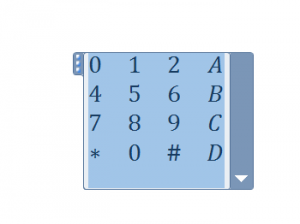 A hand-made 4×4 matrix in Equation Editor for Microsoft Word 2010.